The two C-26A aircraft owned and operated by the Regional Security System (RSS) Air Wing were donated by the US Government in January of 1999. It was expected that the operation of the two aircraft working in support of the RSS Member State Coast Guard units, Drug Squad Units and International Law Enforcement Agencies would enhance the Counter Drug (CD) effort in the region. These expectations were clearly met from the inception. Notwithstanding limitations in the first two years of operations when the aircraft were yet to be fitted with a surveillance package, the Air Wing could still boast of Go-Fast sightings and disruptions. These challenges were met head on with upgrades to the airframes, installation of sensors and the necessary training for the crew and maintenance personnel. At the end of 2005 full funding of the Air Wing by the US Government seized following which, the RSS took over all aspects of funding as the need for this mission critical capability became more evident. The two aircraft were recently refurbished and upgraded with modern state of the art sensors through funding provided by the Governments of the US and Canada. The two C-26A aircraft are a force multiplier in the region with the ability to work with several countries to meet their security goals. This was clearly evident during Cricket World Cup held in the Caribbean in 2007, and in the aftermath of the devastating earthquake in Haiti in January 2010, when one aircraft was deployed to Jamaica for a period of five weeks in support of the Jamaica Defence Force; more recently the Air Wing participated in the relief efforts in support of the countries devastated by Hurricanes Irma and Maria. The Air Wing supports a diverse number of RSS objectives, but continues to focus on maritime counter drug operations as its primary mission. The broad array of capabilities of the aircraft combined with highly skilled and motivated personnel allow for several objectives of the RSS to be met with success in addition to counter drug missions. Search and Rescue (SAR), fisheries protection, pollution control, and disaster relief are some of the other missions conducted by the Air wing. The capabilities of the aircraft are not limited to maritime operations only, but extend to land based operations as well. Several Marijuana eradication operations routinely carried out by law enforcement units within the RSS Member States have been supported by the Air Wing; reconnaissance missions identify fields and provide command, control and communication for troops conducting the eradication exercise. The RSS Air Wing is an established and fully functional unit, and at the forefront of maritime CD surveillance missions in the region. The unit enjoys, and benefits from a close relationship with its international partners, in particular with the UK National Crime Agency (NCA) and the Joint Inter Agency Task Force (JIATF) South, with whom it shares a Memorandum of Agreement (MOA) to provide aircraft support for counter drug missions. 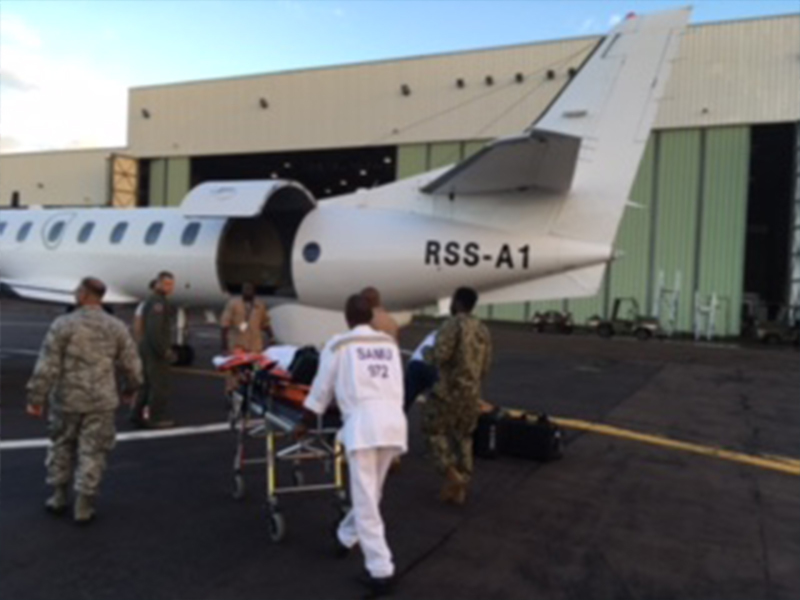 To date the Air Wing has logged just over 16,000 flight hours in support of the region. The Air Wing operates from the South ramp of the Grantley Adams International Airport Incorporated (GAIA Inc) where the aircraft are housed in two hangars. The Air Wing conducts its own maintenance, a function previously undertaken on contract by provincial Airlines of Canada until 2014.